This was splendiferous. At 2pm I was there alone, and I thought “Oh!Oh! I a have birthed a lemon”. But no. By 3pm things had hotted up, and I had to excuse myself at 4.30 to go teach yoga. I sold more than I had anticipated which is fabulous – so THANK YOU, THANK YOU, all of you who came and supported us in this endeavour. Reds is going to support us with ongoing Angel Exhibitions. So, if you didn’t catch us on Sunday drop in there during business hours and have a browse. I have replaced the major paintings that were sold. Reds Restaurant, High Street, Woodend. (next to The Commonwealth Bank). Winter is on the way, and yoga usually hots up at this time. There seems to be a pattern emerging, and I love patterns. Please gang, get your yoga gear out of moth balls. Coming to class two weeks out of four is depressing for our teachers. I know, I have had to do this from time to time, and it is not useful from the students point of view either. We need your smiling faces there weekly – well we would like more than weekly, but weekly will do. Cost: $20 Casual and $135 for a 10 CONSECUTIVE Class pass. A discount of this size is not available for the occasional visit. We can only make this big discount to honour those students who come to class weekly, and have been doing this for a long, long time, it is our way of saying thank you. Please don’t use this pass like we have used it in the past. In the past, the discount was small, and we were relaxed. Not with this one. THE AUSTRALASIAN YOGA INSTITUTE IS MISSION DRIVEN AND MEMBER SUPPORTED. BECOME A REGISTERED MEMBER TODAY. PAINTINGS – THE ART SHOW. First off a thank you for all those people who supported our work by attending the art show. Thank you, thank you…. Thank you especially to those who came long distances, and those who haven’t attended our school for years but still remain in contact and support us. Thank you to those who continually donate, who support the Foundation, and who are always there when help is needed. The art show was terrific. I got there early (as I usually am) and there was no-one there. At 2pm we had a couple of visitors and I though OhOh, this is going to be dismal, however, by 2.45 the place was humming and I was so excited I forgot to take photographs of the crowd. A mistake I won’t make again. I did allow some of the paintings to be taken as they were sold, particularly as one is going to Nepal and others from places quite a distance away and the buyers couldn’t come back to collect the works later. But not to worry, I have plenty more in my head, and one large one on the easel. Angels, angels of course. I will be replacing the sold paintings this week, so if you manage to get to Reds next weekend, new work will be there. I will make every effort to work in this way every week. If you like a work and want to purchase, you can make an arrangement to meet me, pay for it, and pick it up. That way we will have a constantly moving exhibition. If there are lots of enquiries, may be good idea to be there on Saturday afternoons to meet with you regularly… Let’s work it a bit and see what happens. I particularly liked the interest in the actual theme of the exhibition – “Orbs and Angels Among Us”. I spent the whole time talking about angels, and loved it. I wonder how it will reflect in our yoga classes? 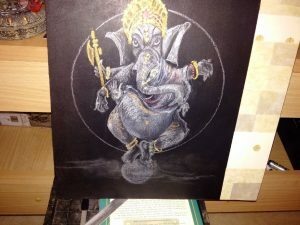 The drawing below is one of my Angels – the God Ganesha. Highly symbolic, this God is “the remover of obstacles”. Many years ago I was initiated into the Hare Krishna organisation. It was during the early 1970’s when they would chant and sing in the main streets of a grey and dreary Melbourne. It was uplifting and I was inspired. I still maintain tenuous contact with the organisation, but have my Initiate name GaneshaDasa in my heart. We’re winning the fight to protect the bees from giant chemical companies — the EU just voted to ban three key pesticides AND the European Court of Justice struck down Bayer and Syngenta’s attempts to sue them for it! Will you help us take this momentum and pressure Australia to do the same? This is exciting work, and with the success of our exhibition, expansion is becoming a possibility. Although I donate my time, I still have to pay rent, insurances, heating light and power – all the services needed to keep open. As well as the services needed to keep me functioning such as Food, petrol, dentist etc – all the expenses you have, I have, and when the work is voluntary, then we have to look at what we can do to pay the expenses. I paint and this helps. This work is increasingly my focus and I am inviting you to join me. Even yoga teachers who haven’t experienced addiction need this teaching, as at the present the statistic is that 60% of the population are addicts. Hard drugs, prescribed medications, alcohol (a “biggie”), nicotine. So 6 out of 10 people standing in front of you have the possibility of being addicted. Even if you can’t see this, even if you can’t recognize what is in front of you they need special help, special understanding – people don’t wear placards saying “I am an addict – please help me!”. Do you want to help? I will be training you to help you, to help them. An amazing mentoring style course. I have received enquiries. If you want to move forward towards the 500 hour certification that comes with this Post Graduate certificate there is a web site that you can visit. www.restore.moonfruit.com . If you do decide to move forward and start the course, then everyone must start with the little course which is on Etsy (www.myyogabooks.etsy.com). We call it our Level 1. At most you will love it and look forward to moving onwards and upwards, if you decide this isn’t the way you want to go, you can use this as your elective if you haven’t yet completed that yet, and it counts towards CE so you can quote this when you re-register. Win, win, win. THE BIKE SHED: A repeat of prior news. You may have seen this on my FACEBOOK PAGE, and in the last weeks newsletter… Please help if you can. The BIKE SHED are aiming to fix 50 bikes for vulnerable families by the end of winter, helping break a viscous cycle and they need help on Thursday mornings. Call Lara a call on 0424 599 168 or Bronwyn on 0409 284 141 for more info, or just show up on a Thursday morning to join in! Why Register with THE AUSTRALASIAN YOGA INSTITUTE? You trained with us, you are a part of our lineage (or we are a part of yours), Registration supports this. PLEASE, PLEASE CHECK YOUR REGISTRATION. You need to be currently registered for your insurance to be valid, and you will need to supply a copy of a valid registration to be insured. Please check your insurance requirements – keep up to date. They change quickly. REGISTRATION – CONTINUING EDUCATION REQUIREMENT. We have fallen in line with other organisations and ask people who are registered with us and wish to re-register to do at least one short course in the year as a continuing education requirement. You need to keep up. You can do one of my little courses on ETSY, or someone else’s, doesn’t have to be onerous, just something to keep you on your academic toes so to speak. Just watching a DVD won’t be enough unless you actually write a report on what you watched and why you watched it – the outcome – how it changed how you do what you do. MONDAY 11.30 Northcote with Ling (Gentle Hatha) Not open public hols. FRIDAY 6.30pm FREE COMMUNITY MEDITATION CLASS. Meditation/Relaxation at The Bentinck. Rugs, cushions, mats provided. A Healing Massage with Jahne can be had between Yoga Classes (at The Bentinck) by appointment only – even on weekends. Yoga $20 per Class Or CLASS PASS – $135 per 10 CONSECUTIVE classes. THE BENTINCK – on the corner of High Street and Romsey Road, Woodend. Enter ONLY through the Romsey Road gate where you see the yoga sign. Do not park in the front of the Bentinck. The main two story building is NOT The Yoga Centre. HOME STUDIO – 37 Morris Road, Woodend. Park on white gravel in front of the studio, or in the drive-way directly opposite in front of double grey garage rolladoors. Not in front of neighbours driveways please. NORTHCOTE: 9 Langwells Pde. (near Aldi). Ling will be taking over these classes, she is our trainee yoga teacher. Plenty of parking at Aldi. FREE 2 Hour park, or All Day nearer the Police Station at the back. If you go to the exhibition, you will see an image called THE GOLDEN ORB, a panting which came out of a regression I did with a young lady. She went back to a time she was a golden orb floating in space. Recalling and putting that experience into context changed her life.. I have had some enquiries this month and am responding here. I always take people for regression who actually have a problem to solve. Not those who are just curious. The regression has the possibility of being “difficult” it is not like being Elizabeth Taylor on the set of Cleopatra. If you want to spend time with me the basic price is $285 for a three hour session. You may need a second ($250). I won’t take anyone who is on medication for anxiety or depression. It dulls the senses and makes regression difficult and the outcome uncertain. There are enough uncertainties as it is. MONTHLY TEACHER TRAINING AT THE HOME STUDIO: The next one will be on Sunday 3rd June, 2pm to 4pm at my home studio (37 Morris Road in Woodend). There is no need to book. Bring writing materials, and be early. If you are teacher Training student then the cost of the afternoon is $20 (to bring it in line with yoga classes – which applies to everyone). If you are a visitor and not formally a student teacher with us then the cost is $30 – for a 2 hour class! Come. BENDIGO Teacher Training classes –Next class is Tuesday 5th June at 3.30pm Turn at the Metricon building on the highway in Kangaroo Flat. It is a traffic light intersection, just up from Bunnings. Crusoeden is the building behind Metricon building, and faces Church Street. It’s easy to find. Cost: $20 per class (to bring it in line with the cost of a yoga class) for everyone who attends – thank you. (Directors – Jayne Boyle – crusoedenbody@bigpond.com). Regular classes held – please email for timetable. NEW ADDITIONS TO THE SHOP AND ETSY. Why haunt libraries for information on the chakras, yamas, and other yoga philosophies relevant to the course (or The Tarot). It is all on ETSY. We do plan to update our shop (and the prices) with the new web update, but we will never be able to offer the options and service of etsy which has millions of customers. For you who have never used ETSY please visit. It is fabulous and oh so EASY. You will find all our books, our DVD’s and CD’s on ETSY. (The Paul Grilley DVD’s are on our web site shop). Please go to www.myyogabooks.etsy.com. Or www.yogabeautiful.com.au. for the Paul Grilley DVD’s (price about to go up as the exchange rate gets more difficult). If you are new and haven’t read about YAMAS, CHAKRAS then I have distilled them for you. Go to the Etsy site as above and have a look – especially at the new book and DVD on Hypermobility..
EMAIL/POST: Please use the email address yogafirst@optusnet.com.au for anything to do with accounts, or the usual yogafirst@netcon.net.au. to get to me. If you do want to speak to me personally, then email, make a time suitable for both of us, and then we can chat. If you do it this way, rather than just “wing it”, you can be reasonably sure I have time, and you will get my attention. POSTAL ADDRESS is not at my home – Please address all land mail to PO Box 14, Mt.Macedon. Vic. 3441. Until you see a change written here in large letters, that is where it will be. Don’t forget to Register if you are teaching even if you have not graduated (especially if you have not graduated), insure and re-subscribe to the videos every 12 months. Don’t leave these to the last minute. Well, things are going especially well, and the exhibition is coming up on Sunday next. I have felt pretty relaxed and organized. Already I have sold three. The biggest and the smallest. I know the angels are watching (of course they are). I have had visits whilst I work – even in the middle of the night. I have known since I was a small child that I am loved by the beings who reside in the ascended Light realms. I am learning to work with them, and they come to me from the higher dimensions. These light beings collaborate with us (not just me), in serving Prime Creator. This is, ‘The Way’. They live in my work. Please click on the link below to see four beautiful photos which have informed the Orbs/Angels in the Exhibition. EXHIBITION AT: REDS RESTAURANT, Sunday the 27th May at 2pm. People have been dreaming of me painting ORBS, actually dreaming, so the universe is helping. Thank you to those who have reported back to me… I really appreciate that affirmation of what I do. If you can’t come, then please donate. For donations $75 and over, patrons will receive one of my silk angels ready to frame. Go to Foundation.moonfruit.com for details. Hi there. READ CAREFULLY. We are still working on the videos. You should be keeping a note of everything yoga you do. This is no exception. Keep in mind double timings – By this I mean if you watch the philosophy video for 15 minutes, that is contact hours 15 mins, and philosophy 15 minutes. Backtracking is hard. This is exciting work. It is increasingly my focus and I am inviting you to join me. Even yoga teachers who haven’t experienced addiction need this teaching, as at the present the statistic is that 60% of the population are addicts. Hard drugs, prescribed medications, alcohol (a “biggie”), nicotine. So 6 out of 10 people standing in front of you have the possibility of being addicted. Even if you can’t see this, even if you can’t recognize what is in front of you they need special help, special understanding – people don’t wear placards saying “I am an addict – please help me!”. WHY THE FOUNDATION? THE NOT-FOR-PROFIT ARM OF OUR INSTITUTE SUPPORTED BY OUR ART SHOW ON SUNDAY. It is simple. The government has always been reluctant to fund yoga programs, and that has a flow on effect. The amount of yoga/meditation and yoga philosophy classes that are needed and wanted by people going through rehab, cannot be supported. So we have always supported our own work. The need has never been greater. I give lots and lots of voluntary hours – and increasingly our graduates do too. Support the Sangha. THE BIKE SHED: You may have seen this on my FACEBOOK PAGE, and in the last weeks newsletter… Please help if you can. We have fallen in line with other organisations and ask people who are registered with us and wish to re-register to do at least one short course in the year as a continuing education requirement. You need to keep up. You can do one of my little courses on ETSY, or someone else’s, doesn’t have to be onerous, just something to keep you on your academic toes so to speak. Just watching a DVD won’t be enough unless you actually write a report on what you watched and why you watched it – the outcome – how it changed how you do what you do. FRIDAY 6.30pm FREE COMMUNITY MEDITATION CLASS. Meditation/Relaxation at The Bentinck. Rugs, cushions, mats provided. 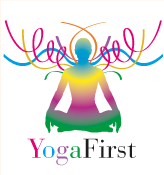 COST: Yoga $20 per Class Or CLASS PASS – $135 per 10 CONSECUTIVE classes. THE BENTINCK – on the corner of High Street and Romsey Road, Woodend. Enter ONLY through the Romsey Road gate where you see the yoga sign. The next one will be on Sunday 3rd June, 2pm to 4pm at my home studio (37 Morris Road in Woodend). There is no need to book. Bring writing materials, and be early. If you are teacher Training student then the cost of the afternoon is $20 (to bring it in line with yoga classes) (which applies to everyone. If you are a visitor and not formally a student teacher with us then the cost is $30 – for a 2 hour class! Come. Picture: Myself, Jacinta Torres-Gomez our newest graduate and Jayne Boyle her mum (also a graduate and Affiliate) at our Bendigo Class.